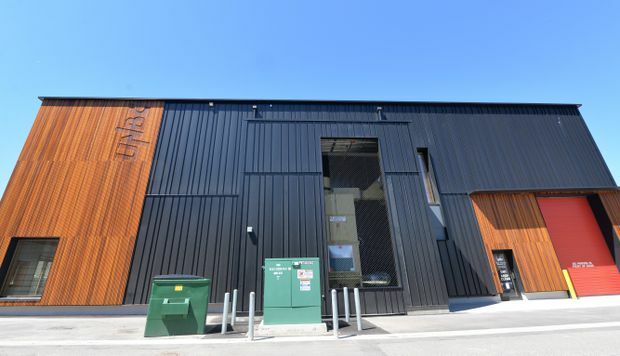 The Wood Innovation Research Lab, shown in this undated handout image, has received Passive House certification. The Wood Innovation Research Lab in Prince George, B.C., appears to be nothing more than a modern cedar and black-metal building, but look past the cladding and you’ll find an engineering feat that has earned it the recognition as the most airtight industrial building on the continent. There are Passive House organizations around the world advocating for high-performance buildings in design, construction and liveability. Thousands of Canadian homes have been certified by the group, indicating they have met limits for heat, energy use and being airtight. Generally, construction costs about five per cent more for passive buildings, but the university is the owner and it’s also interested in the operation costs, Mr. Wimmers said. It will cost about $1,000 a year to heat, Mr. Wimmers said. Mr. Wimmers said they brought in the big red door from Germany and had to optimize it even further to increase the air seal. Mr. Wimmers said he’s been in consultation with several B.C. municipalities and companies about construction of more passive buildings. The end result is all about comfort, Mr. Wimmers said.